Moscow -- A Moscow court has released Kirill Serebrennikov, one of Russia's most celebrated theater directors, from house arrest -- a major change in a case widely criticized as a political show trial and that has drawn comparisons with Soviet-era persecution of artists. Serebrennikov, 41, has been under house arrest since autumn 2017, charged with embezzling from a state funded project. But many in Russia's liberal elite and a host of international artists have condemned the trial, seeing it as a punishment for his work, which frequently tackles topics that are uncomfortable for Russian authorities. Moscow's Meshchansky court on Monday released Serebrennikov on bail, ending his house arrest but keeping his travel restrictions in place. 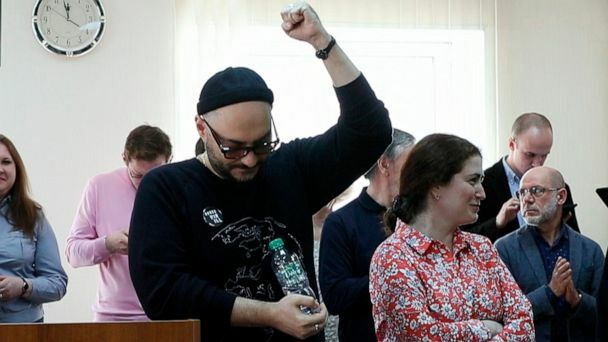 The court also released two co-defendants in the case, one of Serebrennikov's producers, Yuri Itin, and Sofia Apfelbaum, a former Ministry of Culture employee. "It's not yet victory, but it is almost!" Serebrennikov said in the courtroom on Friday, Russian state news agency TASS reported. "We're close!" Serebrennikov, who runs the Gogol Center, Moscow's most prominent contemporary theater, is considered one of Russia's greatest living directors and arguably the most celebrated internationally. His arrest in 2017 shocked Russia's cultural elite, many of whom believed a political crackdown under President Vladimir Putin that had previously largely spared artists had now reached them. At Serebrennikov's first court hearings, hundreds of supporters and leading cultural figures gathered outside demanding his release. Serebrennikov's lawyers have pointed out that prosecutors initially claimed Serebrennikov had stolen part of the money by not staging a play, a version of "A Midsummer Night's Dream." His defense then showed the play had not only taken place, but won awards. Although his plays and films frequently parody a corrupt and cynical Russian state, Serebrennikov has long been at the center of the artistic establishment, and for years was a favorite of some of the Kremlin's most influential officials. In recent years he has directed ballets at the Bolshoi Theater and top officials frequently attended his premiers. Even the theater project now under investigation was created by Putin's decree. Many Russian arts circles believe Serebrennikov fell afoul of a more reactionary atmosphere and the political clampdown that followed Russia's invasion of Crimea. Some see his arrest as a classic authoritarian message telling artists to remain within bounds. Another widespread theory is that Serebrennikov upset powerful conservatives close to the Kremlin with his open discussion of homosexuality in his work. Some have linked his arrest to his ballet "Nuryev" at the Bolshoi, which portrayed the life of Soviet dancer Rudolf Nureyev and was delayed amid claims officials found its depiction of gay themes too frank. Serebrennikov's proximity to power, even as he often provided an unflattering mirror to the powerful, has led to the comparisons with the treatment of virtuoso artists under Joseph Stalin, who would take a personal interest in favored creators as he often banned them. It has also led to soul-searching among Russia's cultural elite about cooperating with the state following his arrest. It was to say, "'If you want budget funds then you should conduct yourself with Russian culture in the appropriate way,'" Gaaze said. The Kremlin on Monday declined to comment on the court's decision. Observers in Russia had noted a shift recently in the coverage of Serebrennikov's trial in state media. Last month, Dmitry Kiselyev -- known as the Kremlin's propagandist-in-chief -- on his flagship show suggested there was no reason not to release him from house arrest. "It's not very easy psychologically, but there's a lot of stuff to do. We have shows, rehearsals," Serebrennikov said.